Andrae Patenaude, or Father “Pat” as he is more commonly known when sporting his priestly collar, began his folk-singing journey with 1971’s Amazing Day, a fine collection of 12-string folk originals. Simple string, brass and woodwind arrangements actually work to the album’s advantage, giving it an intelligent ‘60s AM pop edge. The orchestration was dropped on the less pop-ish Love One Another, which carries some of Andre’s best songs. ‘A Bright Star’ has an infectious organ-backed summery ‘Maggie May’ groove, enlivened with sharp acoustic guitar leads. Organ is also used on the title track to a light psych effect, the tempo shifting back and forth from a slow minor-key theme to a more forceful rock mood. My Life reminds me of the later melodic pop-edged folk style of Ray Repp. Six and twelve-string guitar, some piano, flute, female background singers, sometimes a light rock beat. I especially enjoyed the moving acoustic ballads ‘Peace’ and ‘He Is’. Interesting synthesizer accompanying the edgier ‘My God’. Ride The Morning Wind makes greater use of piano for a rich lyrical soft rock and ballads style similar to Adrien Snell. Christmas At LaSalette is a like-minded studio recording that consists mostly of original material, although some songs appeared in a different form on earlier lps. It’s a Christmas album obviously, but only contains a handful of standards: ‘Mary Had A Baby’, ‘Long Time Ago’ and ‘Holy Night’, the latter sung partially in French. Breath Of God utilizes piano and acoustic guitar within a very mellow setting of soft strings. (The Archivist by Ken Scott, 4th Edition). A special thank you to Ozark Ken for the music. I don't care much for you xmas carols Dia (but i fully understand why you poste them), but i realy do enjoy Ft. Pat, thank you very much for this. can you please upload the lp again? 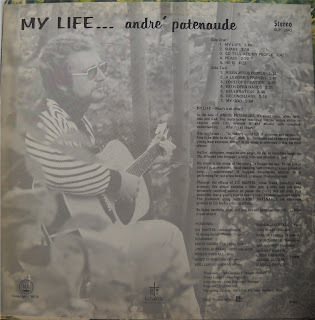 André Patenaude, from My Life . . .